The Doctor, Alice and the Sapling – now growing further into adulthood – take on a new wave of insane adventures! Still missing many of their most treasured memories, the TARDIS team stumble across a Memory Ark, where their reality starts to fray further at the edges… Then, can the Doctor and Alice stop the Sapling from growing into the genocidal creature of destruction it may be doomed to be? Veteran Who writers George Mann (Warhammer 40,000) and James Peaty (Supergirl) join with incredible artists I.N.J. Culbard (Wild’s End), Ivan Rodriguez (Doctor Who: Supremacy of the Cybermen) and Wellington Diaz (Nova) to explore the Eleventh Doctor’s Year Three comics adventures…! The previous writing tag team of Alex Paknadel and Rob Williams take a break during this volume, with James Peaty filling in during the opening one-shot tale, Time of the Ood. Featuring a space station situated alongside a black hole, creepy controlled slave Odd, the issue of Ood liberation and a visit to the snowy Ood-Sphere, Peaty’s plot is a fusion of elements from The Impossible Planet and Planet of the Ood. Fainting as a result of telepathic contact, the Sapling sits most of this adventure out, like Nyssa did during Kinda. In this volume, the tree person is pink in colour, which at times makes him look uncomfortably like a naked child (previously he had tended to be white or pale grey, with a less smooth, more bark-like body). This is particularly noticeable when the Sapling collapses and the position of Alice’s arm, as she rushes to his aid, looks like convenient censoring. I.N.J. Culbard’s art is full of his trademark wacky shapes and expressions, including a blue alien with huge teeth and several looks of bewilderment from the Doctor. The artist is well suited to drawing the tentacular Ood. However, his work appears a little rushed compared with his previous contributions to this series. It seems as though he, like Paknadel, Williams and the Sapling, could do with a rest. It’s time to have a little heart-to-heart with the Sapling about his destructive potential… but first, the trio must investigate an abandoned spaceship floating in the vast emptiness of the Antrozenus Zone…! George Mann handles the writing chores for most of the rest of this graphic novel, beginning with the two-part The Memory Feast. As its title suggests, this tale revolves around recollections – there is a memory parasite at work. However, this has nothing to do with the Sapling’s powers or the evil scheme of the Scream, the rogue Silent who caused the tree creature to acquire some of the Doctor and Alice’s knowledge. The story takes its time to develop in terms of incidents per page, though as there is also less dialogue on each page than we are used to from this title, it’s actually quite a quick read. The intriguing plot adds to the page-turning quality, with an enormous and mysterious spaceship containing a roomful of wind-chime-like controls, which gives way to an open-air environment of rocks and waterfalls. This and other spaces are impressively rendered by Culbard, the aforementioned wilderness being introduced in a beautiful double-page spread. Little squares at the edges of certain frames prove to be more than mere decoration, and there are also some sinister green ghost-like creatures, the Thrake. Well, they’re green most of the time – in one panel, colourist Triona Farrell fails to spot them against Culbard’s landscape and ends up painting them the same orange as the cliff side. Aside from that glitch, however, this is a visual feast. The TARDIS crew visit an Earth festival, with unexpected consequences – the Sapling gains memories he’s never had before! They didn’t come from Alice or the Doctor – so where did they originate…? Culbard gets his holiday at last, and a veritable committee of artists – Ivan Rodriguez, Wellington Diaz, Klebs Junior and Leandro Casco – step in to realise the final full episode of this collection, the single-part Fooled. The combination of contributors results in a mixture of styles and likenesses and thick and thin line work. 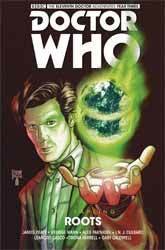 Diaz, who provides the opening page, gives us one of the more stylised renderings of the Eleventh Doctor, while Junior is more reliant upon photographic reference. Rodriguez produces the largest proportion of the art. As we learned from his work on Ghost Stories, he is good at creating expressive children’s faces – and there are plenty of those at the fairground in this story. There is yet another memory thief at work here. Though this is once again a coincidence rather than being part of the ongoing Sapling / Scream plot, at least this time the arboreal boy’s abilities form part of the solution. In terms of personal development, the lad enjoys all the fun of the fair (rides, hook a duck, ice cream, etc) and also learns the value of a little white lie, quickly cottoning on to the Doctor’s suggestion that he should pretend to be a human boy wearing a costume. The strip also boasts finely detailed artwork by Pasquale Qualano. Something that he has borrowed is the bridge of a Nova-class starship from Star Trek as reference for the interior of the Gilmore.